Enhance your gambling experience and choose to play Live Blackjack at Genting Casino! 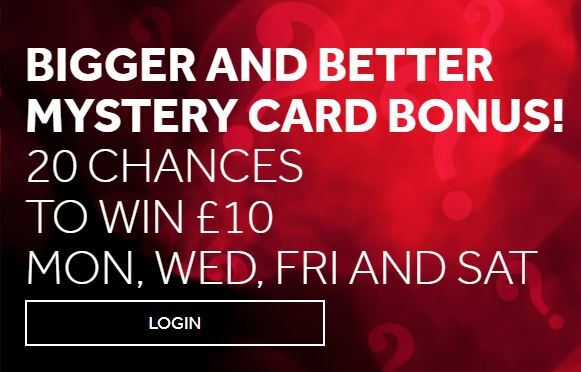 With Mystery Card Bonus, you have 20 chances to win 10 Pounds every Monday, Wednesday, Friday and Saturday. Make a deposit of minimum 20 Pounds on the day of the promotions or the prior 7 days. Take a seat at a Live Blackjack Table and place a bet of at least 10 Pounds. 20 Mistery Card are hiding in the deck and if at least one is revealed on your hand, you will automatically receive a £10 bonus. You have 3 days to accept your bonus and 2 more days to use it. If you desire to withdraw your winning you need to fulfill the 10x wagering requirement. Suitable for new or experienced players, this bonus will offer you the true gambling experience. Don't miss this awesome chance and access Genting Casino now!